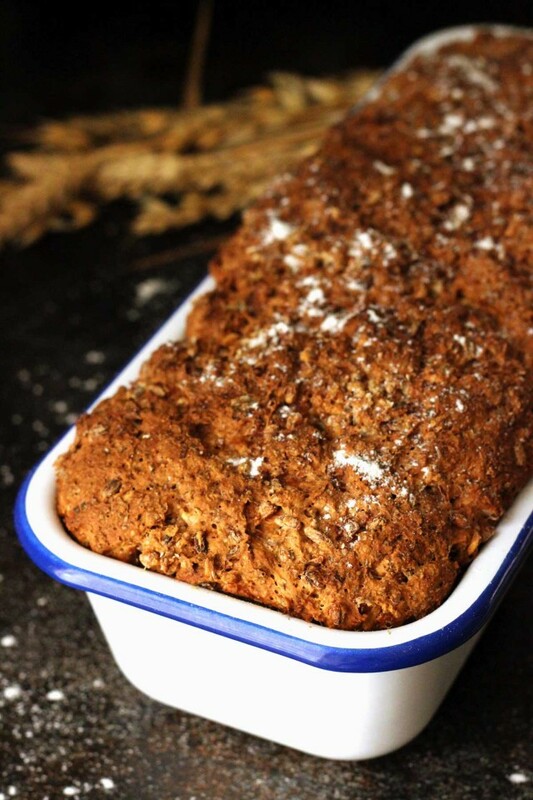 Healthy Wholemeal Bread recipe is vegan, simple and just perfect for beginner bakers. 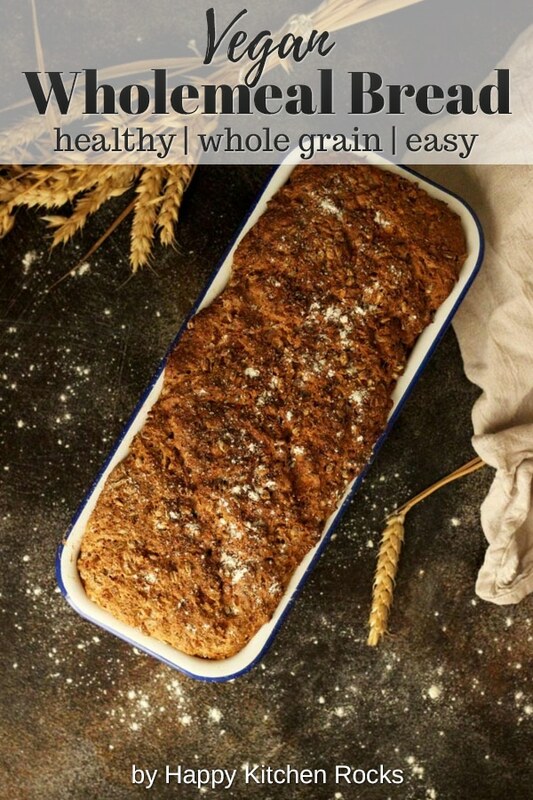 Learn how to bake no-fail healthy whole grain bread using just a few ingredients you can easily tweak! Healthy bread sounds like something unreal. But it’s not if you make it yourself from scratch! Is store-bought “whole grain” bread good for you? It is true that wholemeal bread is healthier than white bread. Playing on this fact, commercial bakers try to market their breads as “healthy”, “whole grain”, “wholemeal”, “stoneground” or “gluten-free”. Sometimes all at once. But it doesn’t mean that store-bought breads are actially healthy. Naturally, wheat berries consist of three essential components: the germ, endosperm, and bran. While the germ contains vitamins and minerals; endosperm is full of carbs, gluten and protein, and bran is packed with fiber. While producing refined flour, manufacturers remove all the “healthy” components (germ and bran) and process carbohydrate-rich endosperm to make white flour. It is done to prolong the shelf life of flour and baked goods. To compensate for this loss, white flour is fortified or enriched with minerals. But the problem is that enriched flour is not digested in the same way as whole grain flour. It basically acts in your body like sugar does – provokes blood sugar to rise, that activated the production of insulin and the drop of blood sugar level. However, insulin is not able to cope with the spike in blood sugar over time, leaving you with high blood pressure, a higher risk of diabetes and excessive weight. That is why enriched refined flour is a “no-go” when it comes to eating healthy. Whole wheat flour is a healthy alternative but it still doesn’t mean that store-bought whole grain breads are. The trick some manufacturers use is that they just add bran and germ back in after they refine flour and still call it “whole wheat”. However, some of the phitonutrients and minerals are lost after processing, while artificial flavorings, stabilizers and other additives are added. It doesn’t make it healthy either. Very dark and heavy breads most likely contain corn syrup or other sweeteners that make them dense. Gluten-free breads often contain too much starch that acts like sugar in your body. Moreover, there is no evidence that gluten-free breads are “healthier” than wheat bread. Whole grain wheat bread contains more nutrients than gluten-free refined bread. In fact, if you don’t suffer from celiac disease, there is no reason for you to omit wheat in your diet. Congratulations if you’ve read all the information up to this point. The takeaway is that to make the most out of wheat berries, whole wheat flour is the best (same counts for other grains) and here is why. 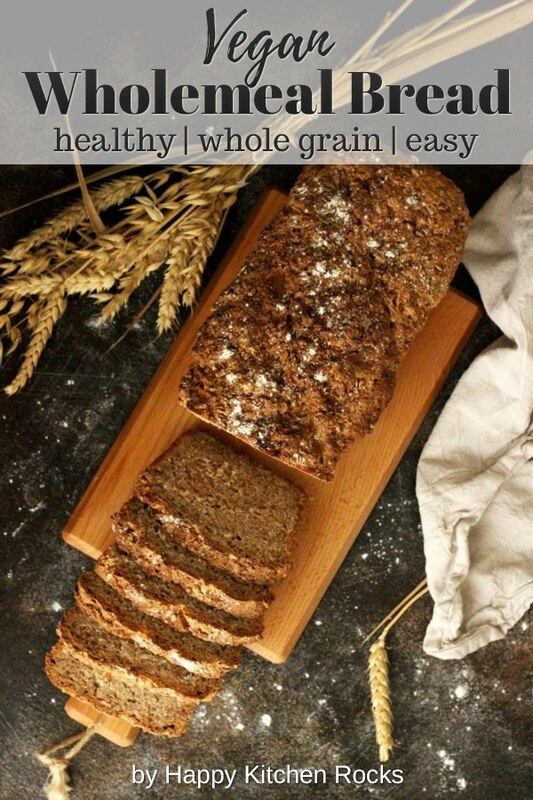 Why Bake Whole Grain Bread? Whole grains contain, among other, vitamins B and C as well as calcium that are essential for bone health and are recommended for pregnant women. These are only some of the benefits of whole grains. 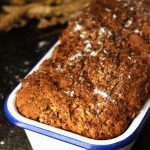 Obviously, home baked breads are always healthier than store-bought, simply because you can control the amounts and the quality of the ingredients you use. Check my No-Knead Beer Bread and Healthy Pumpkin Bread with Walnuts. 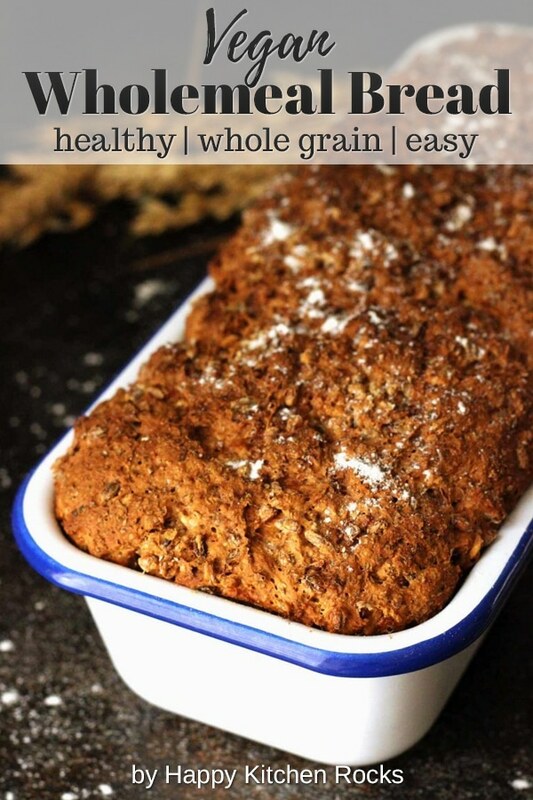 How to Make Healthy Wholemeal Bread? To start with, soak your grains overnight. It can be pure wheat berries or a combo of wheat berries with any (or all) of the following grains: rye, spelt, millet, oat berries, barley and quinoa. After soaking, boil them for 30 minutes or until they are done, drain well and let cool. If you don’t have time for soaking whole grains, just boil them a little longer, until they are tender. Next step will be to combine slightly warm almond milk with maple syrup (or another liquid sweetener of your choice) and fresh yeast. Leave for 10 minutes to activate the yeast. Add flour mixed with salt and knead well until fully combined. Add more flour if the dough sticks too much to your hands. Cover with cloth and let rest for about 1 hour or until doubles in size. To shorten the waiting time, put the dough in the oven under the lowest temperature (not higher than 50 °C or 120 °F). For me this trick works wonders and usually helps me reduce the waiting time in half. Once your dough has doubled in size, add the cooked grains (make sure there is no extra liquid in them) and transfer into a 12 inch rectangular loaf pan greased with olive oil. Cover and let rest for 30 more minutes. Preheat the oven to 220 °C or 430 °F. Bake the wholemeal bread for 20 minutes, then lower the temperature to 190 °C or 370 °F and bake for about 40 more minutes. Check the readiness by inserting a toothpick in the middle of the loaf. The bread is ready when it comes out dry. This recipe has a certain degree of flexibility to help you adjust the ingredients to your taste. Feel free to experiment with different grain mixtures, sweeteners and nut milk. Let me know which combo you used and how you like it in the comments! I’m so curious! P.S. 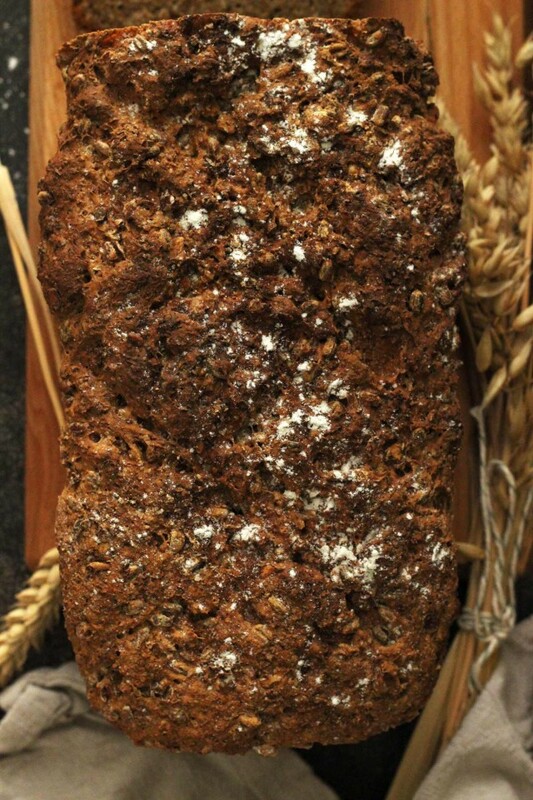 I have a recipe of Whole Grain Spelt Bread recipe for you to try, which is also very healthy and delicious! To start with, soak your grains overnight. It can be pure wheat berries or a combo of wheat berries with any (or all) of the following grains: rye, spelt, millet, oat berries, barley and quinoa. After soaking, boil them for 30 minutes or until they are done, drain well and let cool. If you don't have time for soaking whole grains, just boil them a little longer, until they are tender. Combine slightly warm almond milk with apple cider vinegar, maple syrup (or another liquid sweetener of your choice) and fresh yeast. Leave for 10 minutes to activate the yeast. Add flour mixed with sea salt and knead well until fully combined. Add more flour if the dough sticks too much to your hands. Cover with cloth and let rest for about 1 hour or until doubles in size (see notes). Preheat the oven to 220 °C or 430 °F. 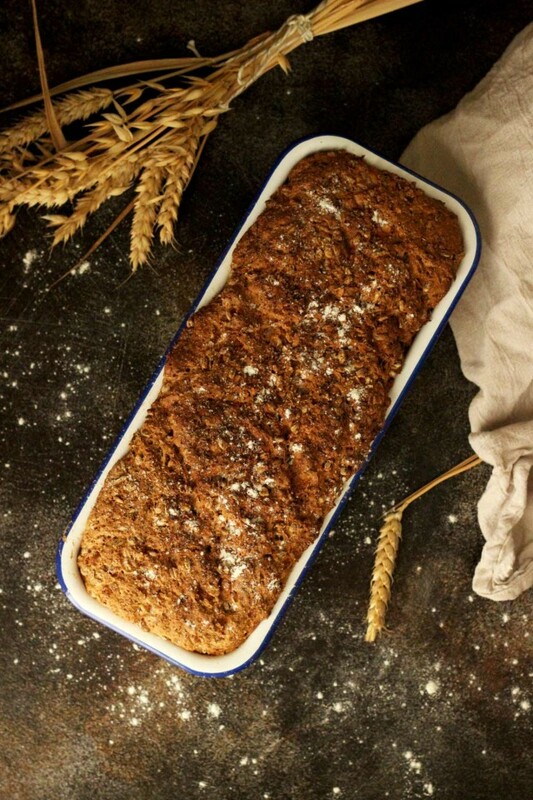 Bake the wholemeal bread for 20 minutes, then lower the temperature to 190 °C or 370 °F and bake for about 40 more minutes. Check the readiness by inserting a toothpick in the middle of the loaf. The bread is ready when it comes out dry. Enjoy! 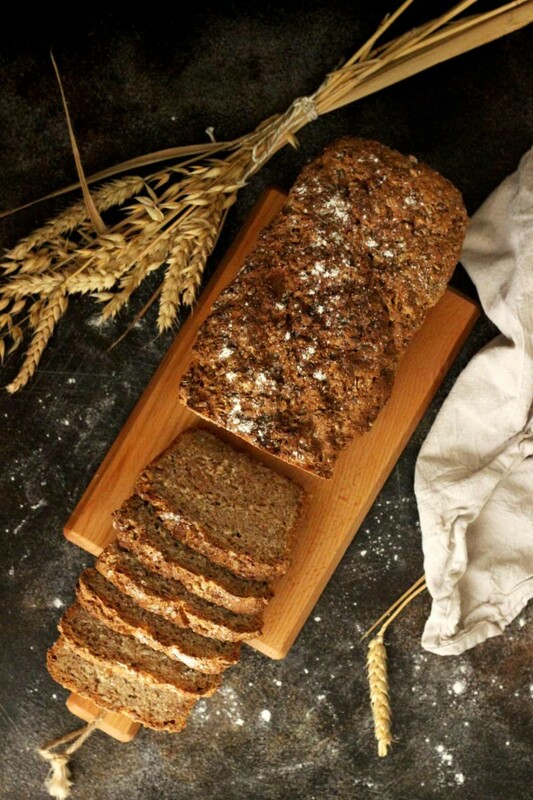 I tried this bread and found it very easy and yummy! I have one concern, though. The baking time seems too long. My bread crust was very hard, we could hardly cut it. Definitely over baked. Hi Estelle, so happy you like the bread! If it was over baked, try to decrease baking time to 40 minutes in total and insert a toothpick in the loaf to check the readiness. If it comes out sticky, bake for 5 more minutes and check again until the toothpick comes out dry. Hope it helps! Do you have any vegan bread recipes that I could mske in a bread machine? Hi Mindy! Unfortunately, I don’t have a bread machine (yet!) so I don’t have bread recipes specifically for the bread machine. But if you are willing to be my tester, I don’t see why this recipe wouldn’t work for the bread machine? Let me know if you decide to try it! Otherwise, here is a whole wheat bread recipe that seems to be good. Thank you so much Karyl! Freshly baked bread straight from the oven smells like heaven to me! I don’t often eat grain anymore but this definitely reminds me of the breads my mom used to make as a child. What a wonderful scent to fill a home with! Food is so much about memories! Thank you Jenni!